As Ethiopia remakes itself at home under Abiy, it is also forging a new set of ties with wealthy Middle Eastern nations across the Red Sea, breaking from a decades-old pattern of keeping them at a distance. Well before Abiy’s rise, an intense wave of Gulf Arab and Turkish outreach had begun stitching the Horn of Africa into the fabric of the greater Middle East, redrawing the geostrategic map in ways both promising and worrisome. To the surprise of many, Ethiopia is now reaching back. For decades, Ethiopia’s foreign policy sought to guard its independence from outside powers and warned against Arab encirclement or entanglement. Abiy has charted a starkly different course, betting on his ability to effectively partner with and enlist the support of Gulf Arab states and even Egypt, one of Ethiopia’s traditional adversaries. In 2018, Abiy accepted $3 billion in aid and investment from the United Arab Emirates and a year’s worth of oil, with payment deferred, from Saudi Arabia. He made warm early visits to both countries and to Egypt. Given these developments, Ethiopians are increasingly wondering whether their country is headed toward a previously unthinkable alignment with Arab powers. Like their Somali and Eritrean neighbors, they are also hotly debating what closer Middle Eastern ties would mean for their own lives and their country’s place in the world. Listen to Daniel Benaim discuss this article on WPR’s Trend Lines Podcast. This debate is unfolding at a moment when several of the country’s distinct strategic neighborhoods—the Nile region that traces the ancient river through Sudan and Egypt; the fractious Horn of Africa that juts off the continent; and the Arabian Peninsula across the Red Sea—are converging. All the countries of the Horn are confronting a remarkable surge in political, economic and military investments from Gulf nations and Turkey, as well as from Russia, China and even the United States. The result has been a mini-Great Game, as outside powers vie for influence over capitals, farmland, waterways and ports in ways that could bring the region closer together, or exacerbate existing divisions. Ethiopia’s Middle Eastern neighbors have underwritten both the Eritrea peace initiative and a string of Gulf-owned African ports that could help connect Ethiopia, the world’s most populous landlocked nation, with the global economy. But zero-sum competition between Arab states also threatens to polarize and militarize the region by exporting Gulf rivalries into Africa. As if these changes weren’t enough, Ethiopia is also building Africa’s largest dam on the Nile—a mega-project that could revolutionize Ethiopia’s long-term development prospects, but that also puts the country at loggerheads with Egypt, the most water-poor large nation on Earth, with a population of nearly 100 million people. In light of all these factors, it’s not hard to see why Abiy’s transition has commanded international attention—and why it should matter to the United States as well. If Ethiopia can pull off competitive elections and secure its historic peace, it could become an anchor of stability and statesmanship in a region of growing strategic importance that is desperate for both. On the other hand, if things go wrong, this country of nearly 110 million people could slide into authoritarianism or communal violence and become Africa’s next major exporter of refugees. Last year, ethnic clashes resulted in more internal displacement in Ethiopia than in any other country, including Syria. In terms of its politics, Ethiopia’s risky leap for democracy has made it a rare and important exception to the global illiberal trend. As Washington attempts to shift the focus of its foreign policy from terrorism toward great-power competition, Abiy’s plans for economic and democratic reforms, his interest in peacemaking and even his evangelical background suggest that there is an opportunity for American officials to broaden bilateral relations and compete for influence with China. I recently spent a week conducting interviews with foreign policy experts here to understand how Ethiopians are responding to these bracing changes in the country’s domestic and foreign policy. What follows includes on-background quotes from numerous officials and scholars who asked not to be named, given the tenuous state of Ethiopia’s current political opening. Whether they support him or criticize him, most Ethiopian experts agree that Abiy’s personal style and foreign policy are closely linked. A former soldier and intelligence officer, he boasts an undergraduate degree in cryptography and graduate degrees in leadership and business, all from institutions in Ethiopia. His graduate thesis, written while studying at the Institute for Peace and Security Studies in Addis Ababa, centered on conflict resolution, specifically religious conflict in the Jimma zone of his native Oromia region. For decades, Ethiopia’s foreign policy sought to guard its independence from outside powers. Abiy has charted a starkly different course. Prior to being appointed prime minister, Abiy had risen through the ranks of Ethiopia’s armed forces, founded its Internet Security Agency and embarked on a brief career in politics, becoming the leader of the Oromo ethnic party within the ruling coalition. From this perch, he rode out years of mass protests and was chosen by parliament to become the new head of the government. Some worry that Abiy’s sense of personal destiny—he claims he knew at the age of 7 that he would one day lead the country—will devolve into a messianic streak. But Ethiopians remain guardedly optimistic that Abiy can bring stability to a region that has long suffered from mistrust and destabilizing proxy violence. Part of Abiy’s popular support comes from his skill as a mediator. In short order as prime minister, he not only ended Ethiopia’s war with Eritrea but also brokered an end to a schism between feuding wings of the Ethiopian Orthodox Tewahedo Church. “These are things that nobody thought would even be attempted,” a foreign policy official under previous Ethiopian governments told me. In one particularly dramatic incident last October, after dozens of soldiers unhappy about their pay marched to Abiy’s office to stage a protest, he defused the situation by greeting them warmly, ordering them to do pushups, joining in himself, then inviting them to dinner. The images quickly went viral. Abiy’s penchant for conciliation is perhaps a product of his unique personal background, a mixture of faiths and ethnicities that Ethiopians hope can bridge the nation’s divides. Abiy’s father is a Muslim Oromo and his mother is an Amharic Christian who converted to Islam. Abiy himself identifies as Oromo. 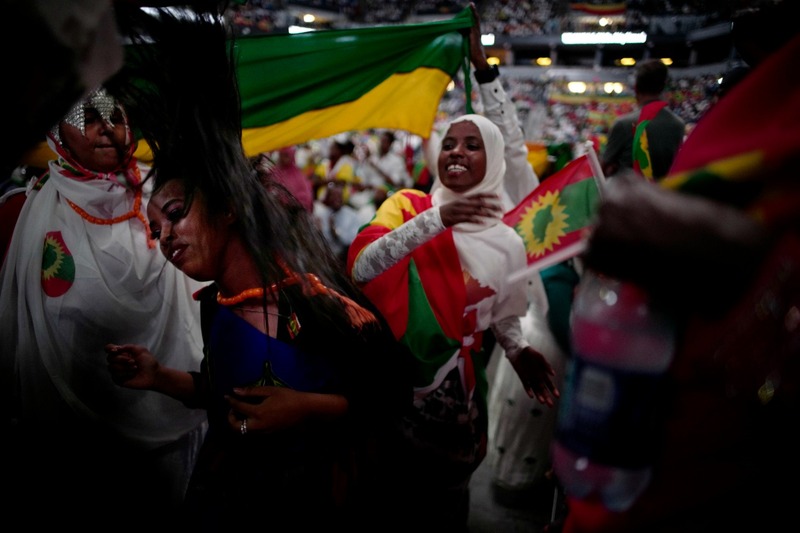 Though there are more than 90 ethnic groups in Ethiopia, the Oromo and the Amhara are two of the so-called big three; the third, the Tigray, is a small minority that nevertheless dominated Ethiopian politics from 1991 until last year. Abiy is an evangelical Christian, an identity he claims proudly. Ethiopia is a religious country, and its citizens are justifiably proud that the Muslim minority, which makes up about a third of the population, lives largely peacefully alongside both ancient Christian communities and the fast-growing Pentecostal community to which Abiy converted. upon his arrival at Addis Ababa International Airport, Ethiopia, July 14, 2018 (AP photo by Mulugeta Ayene). Ethiopians describe peace with Eritrea as historic, but quickly note that more work needs to be done. “The day Abiy went to Asmara will always be remembered,” one current Ethiopian diplomat told me. “But now we need a full framework, win-win outcomes, and clearly defined steps both sides must take.” Indeed, while a state of war on Ethiopia’s border has been removed, Eritrea remains a semi-totalitarian black box, and major details of how to implement the peace are unresolved. Nevertheless, the deal registered as a seismic event in both countries. It has also created an opening for the remaking of Ethiopia’s Middle East ties—one that both sides have seized, to the curiosity and consternation of Ethiopian foreign policymakers. Notably, the peace deal between Ethiopia and Eritrea was signed not on African soil, but on the other side of the Red Sea, in Jeddah, Saudi Arabia. The most striking photo from that milestone showed the two African leaders in the foreground dwarfed by an enormous portrait of Saudi Arabia’s late King Ibn Saud on the wall behind them. The initial groundwork for this scene was laid before Abiy took power. In recent years, the Saudis and Emiratis have grown closer to Eritrea after building military bases there to launch operations into Yemen, where they have been fighting Houthi rebels. Faced with international condemnation for violating U.N. sanctions against Eritrea, they were eager to see Eritrea sign a peace deal with Ethiopia, as they hoped it would bring the country in from the cold while allowing them to extend their own reach further into Africa. The notion that Middle Eastern powers choreographed the process is compelling, but the stronger argument is that Abiy seized the opportunity presented by the fact that he represents a break from rule by the Tigrayan elites, whom Isaias famously despises. Even before Abiy came to power, many Ethiopian policymakers had concluded that the longstanding campaign to isolate Eritrea had failed, thanks to Europe’s desire to work with Eritrea to stem refugee flows and the Gulf countries’ need for Eritrean military bases to fight their war in Yemen. At most, then, Gulf countries’ backchannel diplomacy—and the promise of further aid—likely encouraged Abiy to take steps the Ethiopian political class had already determined were in the country’s interests. Regardless of the precise role Gulf countries played in the Ethiopia-Eritrea peace deal, it is increasingly clear that the deal is part of a larger wave of Middle Eastern engagement in the Horn of Africa, a dynamic that has seen dueling Sunni Middle Eastern power blocs invest in every country in the region. The rivalry between Turkey and Qatar on one side and Saudi Arabia and the United Arab Emirates on the other—fueled by a combination of the Yemen war, fears of climate change-driven food insecurity, commercial maritime interests and zero-sum strategic competition—has indisputably jumped the Red Sea. Despite the peace deal, Eritrea remains a semi-totalitarian black box, and major details of how to implement the deal are unresolved. Consider what has happened in the past few years alone. The UAE and its various port-operating companies have begun building a string of military and commercial ports in Somaliland, Eritrea and the Puntland region of Somalia. Saudi Arabia has turned to Sudan in search of mercenary troops to fight in Yemen, while quietly buying up large quantities of farmland in Sudan and Ethiopia. Riyadh also recently announced a nascent, six-nation Red Sea political alliance, which held military exercises in January involving Egypt, Djibouti, Somalia and Sudan, as well as Yemen and Jordan. Middle Eastern powers have backed rival politicians within Somalia and its federal regions, contributing to polarization and stoking tensions. And Qatar and Turkey have jointly leased a Sudanese Red Sea island whose Ottoman-era port, their rivals fear, will become a military base. Until last year, Ethiopia had kept itself away from this jockeying by outside powers. But that is changing. In March 2018, the Dubai-based firm DP World signed a deal that gave Ethiopia a 19 percent share in Somaliland’s Berbera port. Last November, Ethiopia announced a major real estate deal with a large Abu Dhabi-based private real estate company to develop the La Gare neighborhood of Addis Ababa. And earlier this month, the UAE announced plans for a $400 million road connecting Berbera in Somaliland to Ethiopian territory. 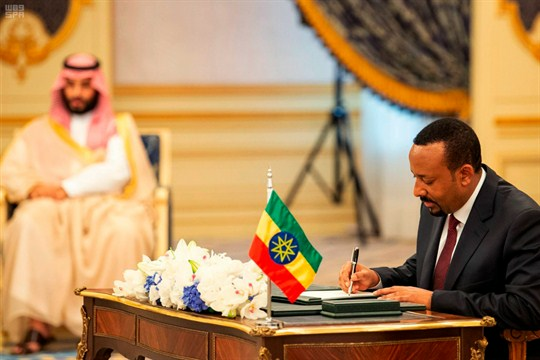 It remains to be seen whether Ethiopia’s newfound ties to Saudi Arabia and the UAE represent opportunistic cooperation, a new strategic partnership—or something else. “People are worried about becoming a client state,” one foreign correspondent told me. Turkey, by contrast, has deeper and more longstanding economic ties to Ethiopia’s markets. Qatar, for its part, is hoping to overcome past differences over Al Jazeera’s coverage of Ethiopian ethnic disputes to deepen its own investments. Both nations were recently accused by Eritrea’s ruler of fomenting instability inside its territory. The expansion of ties with Middle Eastern countries has been met with a decidedly mixed response within Ethiopia. Several experts and diplomats in Addis Ababa spoke in strikingly negative terms about the nature of these recent engagements in the Horn of Africa, describing Gulf foreign policy as arrogant, transactional, unilateral, ill-considered and money-driven—in the words of one U.N. diplomat, “a frenzy of activity that we on the African side are bewildered by.” To be sure, the two regions have cooperated well before. Their shared history goes as far back as when ancient African Christian rulers in what is now Ethiopia gave refuge to the persecuted followers of the Prophet Mohammed who were fleeing the Arabian Peninsula. Much more recently, in the mid-20th century, relations between Ethiopian monarch Haile Selassie and Saudi King Saud were respectful. But more experienced foreign policy hands in Addis Ababa also pointed out that when Ethiopia has gone to war in recent decades with Somalia and Eritrea, Arab nations have supported the other side. “Historically, Ethiopia has never been this close to Saudi Arabia, the UAE, and the other Arabs,” one former top Ethiopian official told me. One recurring subject in discussions about Ethiopia’s Gulf ties is the ongoing conflict in Yemen. After all, the same Gulf countries that helped facilitate the Ethiopia-Eritrea peace deal have also been bombing Yemen from Eritrean soil. Ethiopians note that, like Sudan and Somalia, they could face intense pressure from the Gulf to support the military campaign against the Houthis, which runs counter to the country’s longstanding policy of maintaining neutrality outside Africa. Analysts were confused as to what this all meant, though some saw the lack of any mention of the Gulf bombing campaign as an implicit endorsement of it. This impression was supported by Ethiopia’s vote at the United Nations Security Council in December against a proposal introduced by the U.K. to create humanitarian corridors into the besieged Yemeni city of Hodeidah on the Red Sea—a proposal that was opposed by the Gulf-led coalition and the United States. Others, though, interpreted the anti-war language as a hedged rebuke of the Yemeni conflict and Gulf countries’ role in it. Still others wondered if Abiy was trying to burnish his brand as a peacemaker and mediator without offending his new Gulf partners. A third view held that Abiy was speaking primarily to a domestic audience, urging Ethiopians not to follow Yemenis down the path of civil war. In any case, the departure from traditional diplomatic language—and the confusion that followed—raised questions as to whether the new government’s ambition to change the tenor of its international engagement could be translated into coherent policy. The United States and others have labored quietly to bring Ethiopia, Egypt and Sudan—another downstream country—together to ease tensions related to the project. Technical solutions could mitigate the risks to Egypt and Sudan, but talks related to the dam have made little substantive progress so far. in Guba, Ethiopia, Nov. 24, 2017 (Photo by Gioia Forster for dpa via AP Images). Before Abiy, the Ethiopian government had signaled the dam might be completed as early as this year. But last July, Abiy shocked Ethiopians by announcing that it might not be ready for a decade, absent serious changes to the bodies tasked with building the dam. 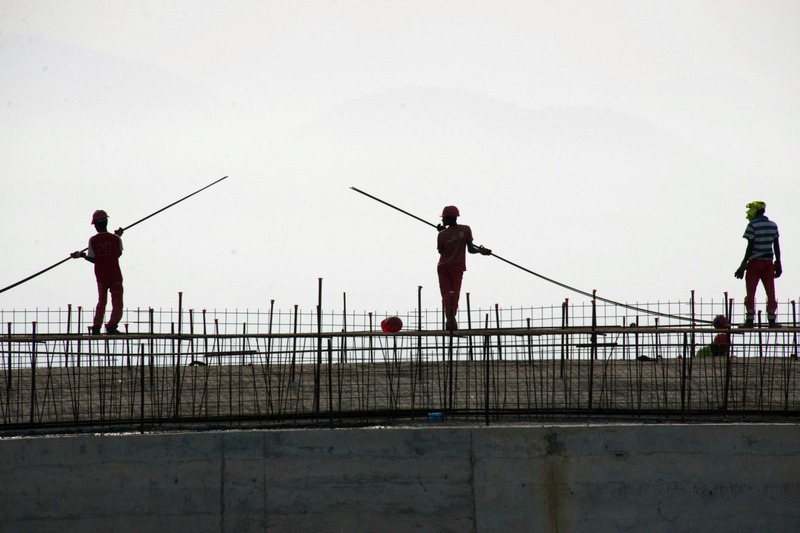 More recently, Abiy has said that he hopes to begin operating the first two of the GERD’s 16 turbines in 2020, working with Chinese instead of Ethiopian national firms, while delaying the complete filling of the reservoir. In the Ethiopian context, Abiy’s attitude toward this massive infrastructure project relates back to his political competition with its architects in the previous regime. Abiy came into office lambasting the alleged corruption of the parastatal firm responsible for building the dam, whose leadership includes Tigrayan military officers close to the previous government. More than a dozen top officials from the conglomerate are facing prosecution, and Ethiopian state television has aired a documentary blaming the dam’s slow progress on the company’s corruption. Many Ethiopians believe expanding ties to the Middle East could help advance one foreign policy obsession: the creation of a pathway to the sea. Some critics believe Abiy is unduly preoccupied with discrediting his predecessors so as to inoculate himself from blame for delays. Beyond that, foreign diplomats and Ethiopians agree that it’s still not clear where the dam fits into Abiy’s larger domestic priorities. “His attention is elsewhere,” one foreign diplomat told me. For all the concerns about expanding ties to the Middle East, many believe it could help advance one Ethiopian foreign policy obsession: the creation of a pathway to the sea. This has been a goal ever since Eritrea broke away from Ethiopia in the early 1990s, turning Ethiopia into a landlocked country. For trade, it relies overwhelmingly on a single-road artery to Djibouti, which charges heavy premiums. While Ethiopia’s economy has expanded quickly, plans to liberalize and grow private industry will ultimately depend heavily on reliable, affordable paths for its exports to international markets. The UAE’s commercial and military strategy of building a string of maritime ports extending from Jebel Ali near Dubai to Aden in Yemen could match Ethiopia’s urgent need to diversify and develop routes from various parts of the country to the sea. 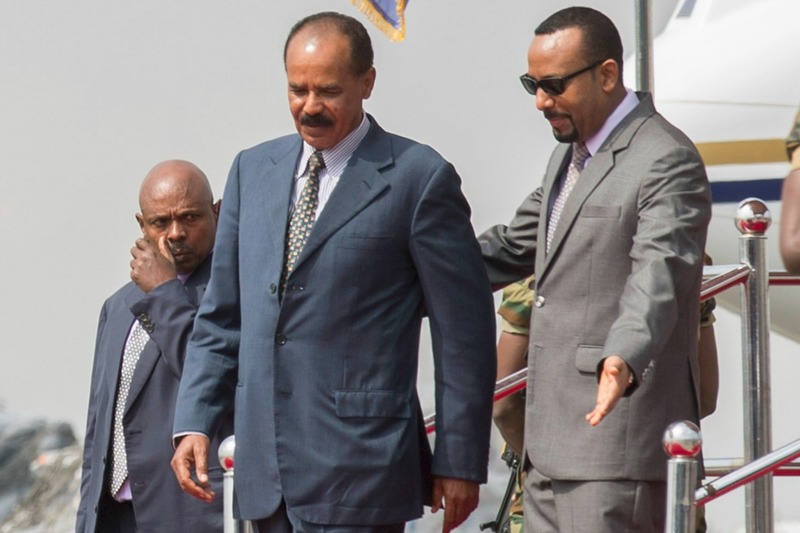 Full normalization of ties with Eritrea holds the promise of reconnecting Ethiopia with what was once its busiest domestic port, Assab, as well as another port in Massawa. A construction project to connect Ethiopia to Berbera Port in Somaliland could create another export route. To varying degrees, Ethiopia is also exploring port and road connectivity to Bosaso in Puntland, Lamu in Kenya and Port Sudan. At the same time, Ethiopia is already leveraging the prospect of diversifying its ports to push Djibouti for lower rates. Ethiopia’s maritime ambitions reflect necessity, ambition and national pride. Despite being landlocked, Ethiopia maintains its state-owned Ethiopian Shipping Line. In March, Abiy signed a military cooperation accord with France to help build a navy. Regardless of the shape these various initiatives ultimately take, they will involve dealing with Gulf-operated ports, creating a mutual incentive for connectivity and reliable access. All these sweeping changes underway in Addis Ababa should prompt the U.S. to reassess its own engagement with Ethiopia and the Horn of Africa at large. In Ethiopia, American support has focused on counterterrorism and aid, while China adopted Ethiopia as a fast-growing “developmental state,” providing large amounts of aid and investment and exporting its model of domestic development. Whether Washington’s goal is stabilizing the Horn of Africa or competing with China, the fragile democratic transition in Ethiopia presents a clear opportunity. If it succeeds, Ethiopia’s political and economic liberalization could make the country a natural and close American ally. If it fails, the result could be not only a relapse into authoritarianism, but violence, instability and mass migration beyond Ethiopia’s borders. Washington can and should work with the Ethiopian government and civil society to provide aid and technical support ahead of elections in 2020, from civic education to media training, to help create conditions for a peaceful, competitive vote. Minnesota, July 30, 2018 (Photo by Richard Tsong-Taatarii for Star Tribune via AP Images). As the geopolitics of the Gulf increasingly factor into developments in the Horn of Africa, the United States also has chance to help establish the institutions and dialogues necessary to articulate shared norms and goals, prevent conflict and facilitate cooperation. The European Union, for example, has delegated a special representative to the Horn of Africa. It may be time for Washington to do the same. Others have called for a “Red Sea forum” that, unlike Saudi Arabia’s recent foray, would bring all relevant stakeholders to the table. Such initiatives will require creativity, deft diplomacy and statesmanship to ensure they are not consumed by internal rivalries or merely weaponized against one or another outside power. But this is a moment for the United States to work on both sides of the Red Sea, and with rival Middle Eastern blocs, to maximize the chances that the jockeying for influence in the Horn of Africa brings the region’s countries closer to each other and to the world economy, instead of tearing them apart. *Daniel Benaim is a senior fellow at the Center for American Progress and a visiting assistant professor at New York University’s Program in International Relations. He previously served as Middle East adviser and foreign policy speechwriter to U.S. Vice President Joe Biden and Secretary of State Hillary Clinton.